Star Trek The Motion Picture, teaser poster (1978) | 'TAIN'T THE MEAT… IT'S THE HUMANITY! I reckon it’s time for another great movie teaser poster. 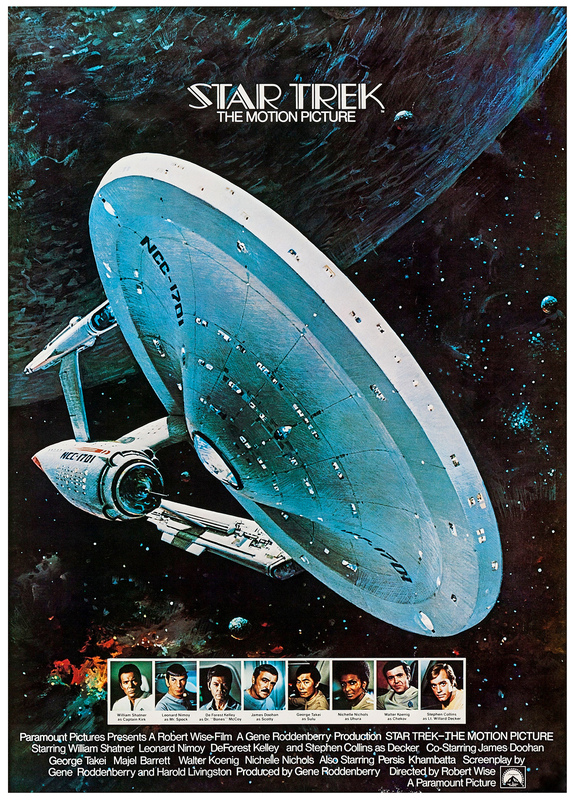 Released in 1978 to herald the upcoming release of Star Trek The Motion Picture, this atmospheric teaser poster featured art by John Berkey, as well as photos of the main cast. Berkey’s wonderfully sleek image of the Enterprise was originally used as early concert art for a new Star Trek TV series that was planned for the mid-1970’s. Entitled Star Trek: Phase II, the series would have been set after the completion of the original five-year mission and featured the return of the show’s original cast. However, the success of Star Wars and Close Encounters of The Third Kind forced Paramount Pictures to rethink the concept and they chose to cancel the series in order to pursue a big-screen version of the project instead. The tweaked teaser poster, note the new logo. The teaser poster was rushed out a year before the film was released (and before any of the special effect work had been completed) hence the use of Berkey’s painting. Sharp-eyed viewers will also notice that the typography used for the main logo also doesn’t match that from the final film. Later in the year another teaser poster was released, this time sporting the correct logo, the addition of Persis Khambatta to the cast photos and a new tagline, the somewhat turgid ‘A 23rd Century Odyssey Now’ (Paramount were clearly trying to conjure up memories of 2001: A Space Odyssey). The final theatrical release poster, featuring artwork by Bob Peak. Although both these posters were soon replaced by Bob Peak’s iconic rainbow painting, I’m a great fan of these early teasers. 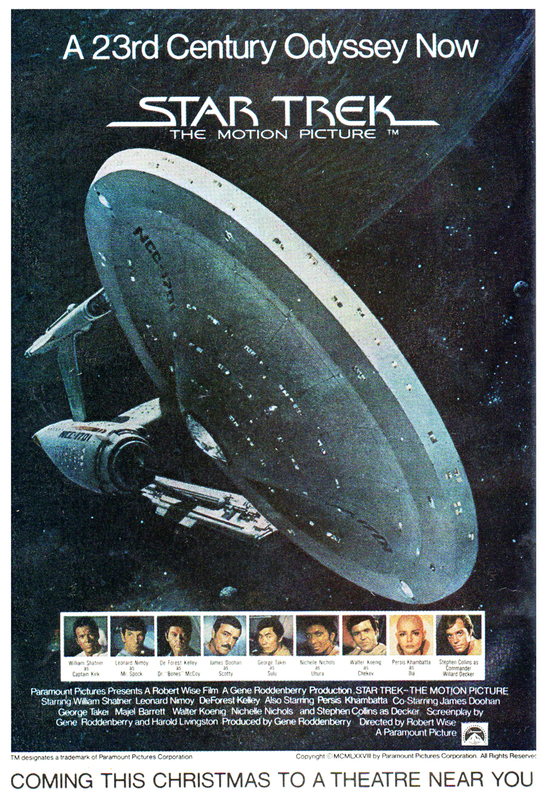 Although a product of necessity, the decision to make the Enterprise the main focus was a good one, as it shows off the new design of the ship (I’m biased though as my favourite scene from the film is Kirk and Scotty’s tour around the outside of the newly refitted Enterprise) and it helped give the poster an epic, sci-fi vibe. And using cast photos, a gimmick used on many big-budget films from the 1970’s, also worked very well. Everything about this poster says big: big budget; big cast; big ship! 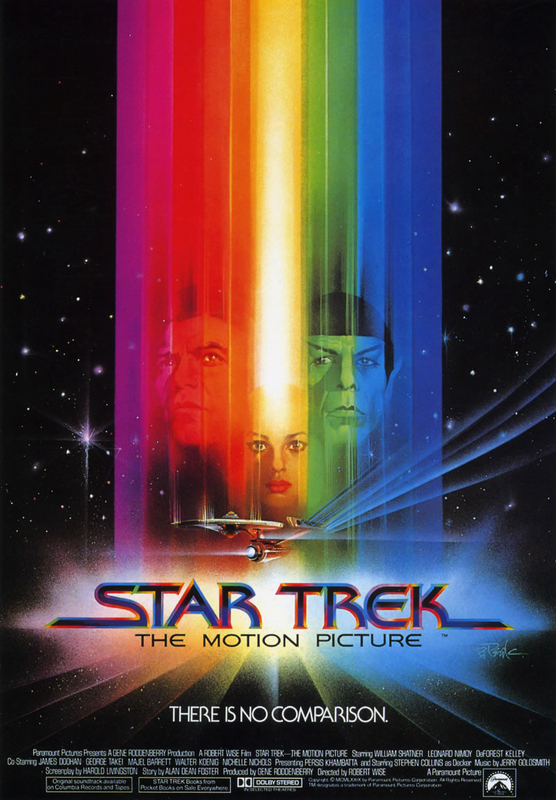 Star Trek The Motion Picture proved a huge hit when released in December 1979, and it went on to gross $139 million (over $710 million when adjusted for inflation). Of course I’m not suggesting that John Berkey’s teaser poster was solely responsible for that success, but it sure as hell didn’t hinder it either.